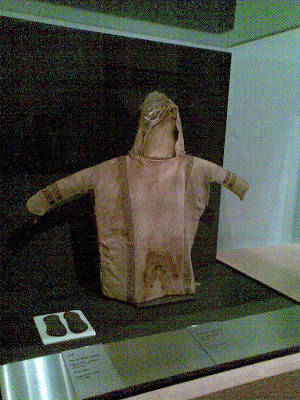 I have only just unearthed this picture I took of a hooded top during my visit to the Byzantine exhibition in the Royal Academy of Arts. Yes indeed, no mistake there - it's an original Byzantine hoodie from the Middle Ages. It's a charming sight to behold, not least because of its age. Nowadays the 'hoodie' itself is the toga of 'chav culture' as this primeval-instinct, Charon-on-your-bus-stop-and-maybe-even-on-your-doorstep, psychopomp 'culture' is popularly referred to here in Britain. Psychopops indeed -they swiftly dispatch you to the Underworld, no judgment necessary. The hoodie - a crude method of concealing your physical identity so as to reveal your mental actuality - lives on. Not that I want to associate the Byzantine 'hoodie' with the derogatory term we all know today, but who knows, perhaps on occasions it might have served a similar purpose. The 'hoodie' is as universal as the insidious person wearing it.